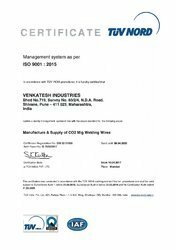 Established in the year 2010, in Pune (Maharashtra, India), we “Venkatesh Industries” are successfully ranked as the well known manufacturer and supplier of CO2 MIG Welding Wire. The offered wires are manufactured by our experts utilizing the finest quality copper and ultra-modern technology in tune with set international norms. These wires are widely used in automobile, railway, bridges, ships, containers, construction machinery equipments and steel furniture & all other welding in general steel fabrications. Our offered product are highly in demand for their unmatched quality and unbeatable prices. These are duly tested by our experts on various quality parameter before final dispatch. We have well-established infrastructural facility that is segregated into enormous departments such as production, manufacturing, quality-controller, procurement, research & development, sales & marketing, warehousing & packaging, etc. Our ultra-modern infrastructural unit is equipped with the latest tools and machinery that helps us to manufacture the offered wires in adherence with set international standards. In order to furnish the vast necessities of our valuable clients, we provide these wires in variety of sizes and other related specifications. The offered wires are packed using superior quality packaging material to ensure complete safety during transportation. Besides, our knowledgeable team of professionals strives hard to furnish the exact demands of our valuable clients within the provided time frame. Today, we have established ourselves as one of the popular brands in this garment industry, owing to the brilliant leadership of our honorable mentor Mr. Dhananjay Deshmukh. Through his vast domain expertise, he has led the organization to achieve a commendable position in the industry. 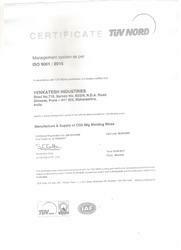 Manufacturing and Trading of CO2 MIG Welding Wire. Venkatesh Industries have been constantly associated with high quality product which consistently provides customer satisfaction. Therefore, the organization envisions itself to offer unwavering commitment to its stakeholders with an aim to add business, organizational and professional value to the manufacturing industry. Venkatesh Industries aspires itself to become the world’s leading manufacturer of CO2 MIG Welding Wire while expanding its avenues with related industries. We aim to consistently offer quality products with sincere customizations to ensure customer delight and business value. We are an EN ISO 9001:2015 Certified company. Venkatesh Industries strongly believes in quality over quantity. Our passion for development of technical solutions and our relentless efforts to add stakeholder value is with an intention to leverage customer and business productivity across the industry. At the same time, the organization is working towards building, sustaining and growing customer value by offering high end systems, processes, and practices with a continued focus on environment friendliness. We strongly believe in offering a quality product that goes beyond customer satisfaction and instead delights them. It is only with quality, sincerity and dedication that Venkatesh Industries intends to grow into the world’s leading wire manufacturing solution provider. The company therefore, continues to enjoy the trust of industry stalwarts like Tata Steel who is our major supplier of raw material. A strong focus on environment friendliness is the result of the company’s philosophy of giving rather than taking. Our respect for the planet’s resources and ecology is shared and appreciated by the industry, our employees and our customers. We believe it is our duty to protect and care for our environment as business, nature and life is meant to peacefully co-exist. We also offer education and medical assistance for our employees and those beyond the boundaries of our organization as both of these are as important as food and water in today’s world. Venkatesh Industries is committed to satisfying customer needs with high quality product & services. Automobile, Railway, Bridges, Ships, Containers. Steel furniture & all other welding in general steel fabrications. We have hired a skilled team of experts, which helps us to stay ahead from other market players of the industry. We have segregated our workforce in to different section like quality inspectors, technocrats, skilled professionals, engineers, sales & marketing personnel. By utilizing their rich industry knowledge, experience and talent, our workforce use the advanced technology to manufacture highly durable and reliable products. We organize frequent training programs and seminars for our experts in order to update their knowledge and skills. We are successfully engaged in providing a qualitative assortment of Copper MIG Wires.